Shortly after MobileActive08 we took the plane to Zambia with South African Airways, At the airport we got a Zain (formerly Celtel) SIM card for about 3000 Zambian Kwacha (less then one US Dollar) and some credit. We were picked up by Patience Tropo with our driver Henry and a Mitsubishi Pajero, which was supposed to take us arround the following days. We took the road from Lusaka towards the Zimbawean border to the town of Chirundu. The road was built by the Chinese and it is in pretty good condition. Near the border there were a couple of hundred trucks waiting for clearance. Most of them were US brands operated by South African companies. Many of them bring in goods to Zambia, a lot of them transit to Congo. In the evening we arrived at Gwabi River Lodge located 20 km east of Chirundu just next to the river Kafue. They offer wireless Internet there for USD 5 for half an hour. We had a very nice dinner at the lodge and decided to do a whole day game drive the following day at Lower Zambezi National Park. So we got up early and hit the road along the river Zambezi. The road was in a horrible condition but after crossing Kafue river with a pontoon we arrived at the first gate about one hour later. Elephants were crossing the road shortly after the gate, which was pretty exciting. Then we lost the track and ended up at Kasaka River Lodge to ask for the way. The guys working at the lodge pointed us to the leaking radiator of our car! So we had a lot of luck not beeing stranded somewhere in the bushes with a overheated car. They fixed it properly and did not even charge for it. Thanks to Kasaka for this great favor. We continued our way and picked up a guide at the park gate, who was supposed to bring us to the animals. 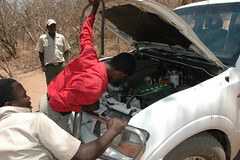 We were not very lucky and we had only one hour left to do the game drive, since we had lost quite some time with fixing the car. We saw zebras, impalas, crocodiles, baboons and vervet monkeys which was still very exciting. No lions though. On our way back we again stopped at the gate and did an interview with Moonga Mulauka, one of the rangers. He mentioned that there is no cell phone network coverage in and arround the park and that they use radios to communicate. He pointed out that no coverage is actually good for the park, because otherwise poachers (illegal hunters) could easily communicate with each other using cell phones. On the next day we went out to Zambezi river with a speed boat to do some fishing. Again, we were not lucky, but the fish were 🙂 We ended up watching a herd of elephants taking a bath in the river and crossing over to a sand bank to feed there. This was terriffic! While on the boat we also did an interview with Moses Banda, the boat captain. After that we went back to Gwabi to do the check out and head back to Lusaka. In Lusaka we met up shortly with Patience again and got to see the Zain headquarters, which is in the embassy area. We wanted to take a picture of the front building which turned out to be quite a hassle, the guards finally agreed after a lot of convincing. More about the trip from Lusaka < > Dar Es Salaam coming up on the next blogpost!